NOTE - To display Return Pricing in the Booking Form, click on "Round-Trip" first. RETURN PRICING (each way) = $49pp Adult , $39pp Child , $149 per Family 2A2C. ONE-WAY PRICING = $59pp Adult , $49pp Child , $179 per Family 2A2C. Child prices are applicable to persons aged 14 and under. Discounted Fee applies to Group Bookings of 7 x Adults or more. 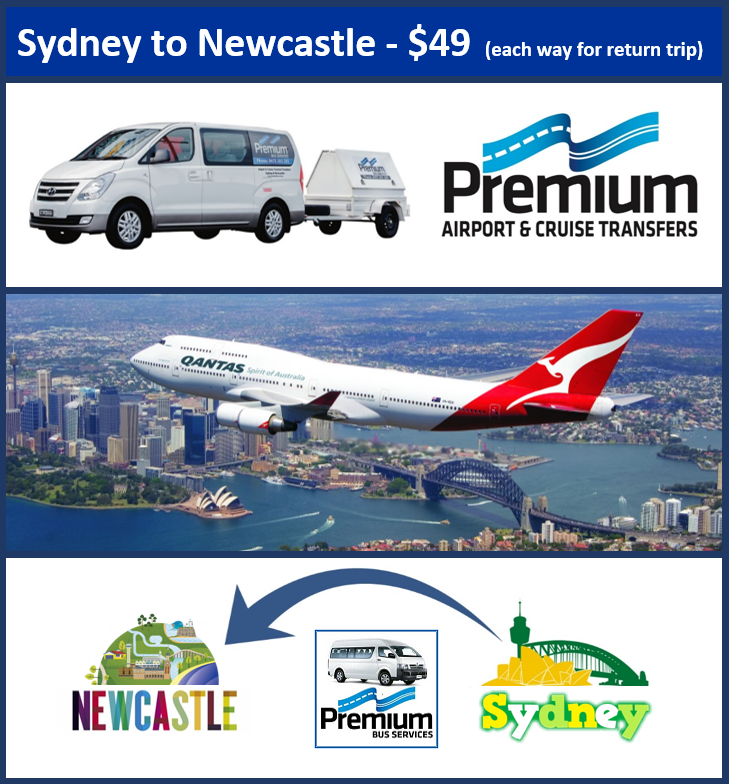 This service provides you with a seamless and stress free transfer from Sydney Airport to Newcastle. We service both the International and Domestic Airport Terminals. Premium Bus Services are a locally owned family business, and through our years of experience have become Newcastle's leading provider of Airport and Cruise Terminal transfers. With an impressive fleet of modern air-conditioned vehicles, we cater for individuals and groups, in order to get you safely and comfortably to and from your Flight. - Don't drive yourself through all that Sydney traffic! - Don't drag your luggage on and off multiple trains! - Don't pay those exorbitant airport parking fees! Premium Bus Services will take care of things for you. This is a very convenient shared service from a single pick up location (Sydney Airport). The meeting point is McDonalds inside the International Arrivals Hall (T1), and Baggage Carousel No.1 inside the Qantas Domestic Arrivals Hall (T3). The cut-off time for bookings is 48 hours prior to departure. However it is recommended to book your transfers as early as possible to avoid disappointment. - Transport in a fully air-conditioned minibus. - All fuel, motor vehicle insurances, toll fees, parking fees, and all other running costs. - If you attempt to book on-line and we are already at maximum capacity, please leave your details on the “Waiting List” and our Admin Team will be in touch with you ASAP, as we can usually add another vehicle to the schedule for dates which are in high demand. - You can either pay the full amount owing at the time of booking, or alternatively pay a 1/3rd Deposit to secure your booking with the balance then payable no later than 14 days prior to departure. - No food or drink is permitted to be consumed in our vehicles.